EVARO – Western Montana motorists worry about hitting deer on the road. Yun Wang worries about elephants. Photo credit: Kurt Wilson/The Missoulian. 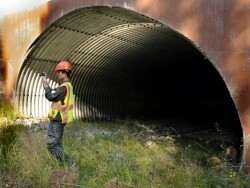 Yun Wang, a researcher with the China Academy of Transportation Services, stands outside a wildlife crossing tunnel under U.S. Highway 93 on Wednesday morning while studying details about what makes the crossings work. 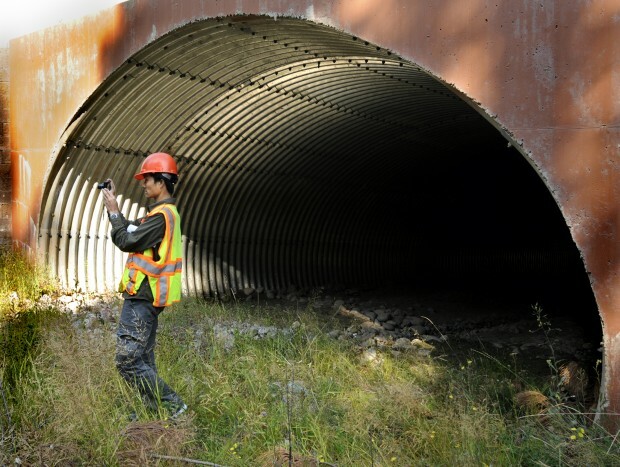 Wang is visiting Montana looking at the effects of the 40 wildlife underpasses and one overpass on the highway between Evaro and Polson. 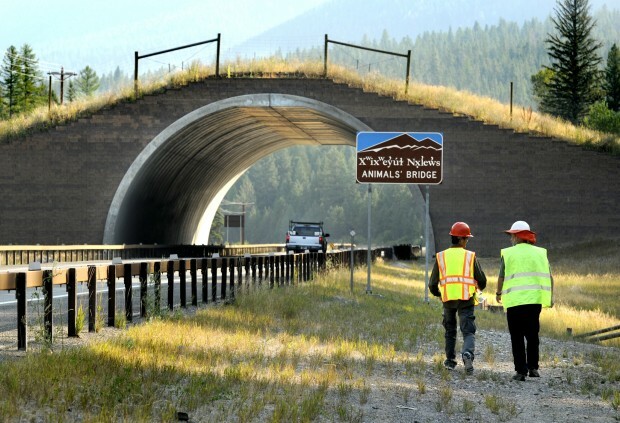 The China Academy of Transportation Sciences researcher has spent the past month in Montana, looking at wildlife crossing projects like the under- and overpasses along U.S. Highway 93 between Evaro and Polson. Where we build such structures to help elk and grizzly bears, Wang has Amur tigers and Tibetan antelope to protect from one of the fastest-growing road networks on the planet. Not to mention 5-ton elephants. Wang was visiting the Western Transportation Institute, based at Montana State University. 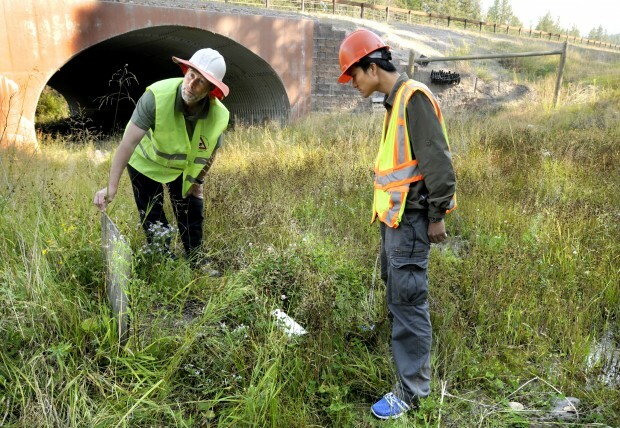 Research ecologist Marcel Huijser and Wang have been mining the Highway 93 project on the Flathead Indian Reservation for more specific details about what makes the crossings work. “Different cultures see different reasons for doing this,” Huijser said. “In North America, the primary reason is human safety. 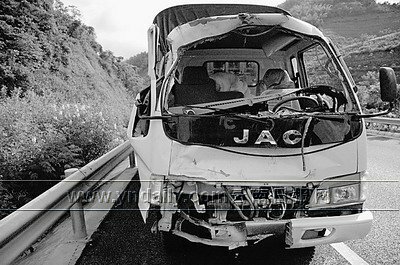 Wildlife collisions cause several hundred deaths a year. There’s a third reason, too. Huijser is completing a study of European, American and Australian wildlife mitigation projects on a cost-effectiveness basis. And what he’s finding is the multimillion-dollar efforts pay for themselves relatively quickly in reduced crashes, lawsuits, medical bills and road maintenance. But to get that savings, the passages must be woven into highway design early, not after the fact. Wang said one thing that attracted him to the Montana project was how the state Department of Transportation and Confederated Salish and Kootenai Tribes included biologists and ecologists in their design process. Such experts also participate in Chinese federal highway programs, but rarely at the provincial level, Wang said. There’s also a lack of knowledge about how to build the perfect passageway. That’s where studying Highway 93 comes in. Although the construction equipment disappeared two years ago, researchers like Huijser continue to prowl the roadside, seeing how different features work. Highway 93 has 40 underpasses of varying sizes and one overpass near the Gray Wolf Peak Casino north of Evaro. Both sides of the highway have 8-foot-high fences along much of the distance between Evaro and Polson, with occasional “jump-outs” where animals that somehow make it to the road corridor can escape back into the forest. Those jump-outs are ramps leading to a drop-off on the safe side of the fence. The drops range from 5 to 8 feet high. Biologists and engineers still don’t know what height will discourage animals from jumping up (and into the roadway) but not scare them from jumping down (to safety). Different animals react differently to the crossing opportunities. So far, 7,000 whitetail deer a year have adopted the passages. But only a handful of grizzly bears have attempted them, and most of those were in the St. Ignatius area. Coincidentally, that’s where the big bears are accustomed to sneaking around human structures looking for garbage, chickens and other domestic windfalls. Few if any grizzlies have used the crossings to explore the Ninemile or Selway-Bitterroot regions to the south and west. Elk also have stubbornly resisted using the crossings. Research from other wildlife crossing projects in Canada and Europe shows elk may take years to get comfortable with the tunnels and bridges. Huijser said one passage in his native Netherlands was working very well for red deer (an elk species relative), until a game warden accidentally shot the herd’s matriarch in a population cull. Without her leadership, the rest of the herd stopped using the passage. Wang said large parts of western and northeastern China resemble Montana in population density and natural features. Those are also areas where new road-building lies in the near future. 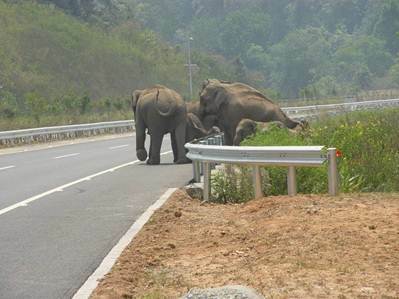 A big expressway already runs from China down to the Thailand capital Bangkok – right through some major Asian elephant habitat. Those elephants move across the road at all hours of the day. Wang and Huijser are trying to win approval for a research project that would show better ways of getting the elephants across safely.